The first phase of Historic New England’s Collections Care Project is days away from completion. Phase one included moving approximately 20,600 objects from permanent storage in our Haverhill, Massachusetts, facility to a temporary storage area elsewhere in the building. The move is the first step in making essential improvements to the permanent collections storage environment and to the accessibility of the collection. 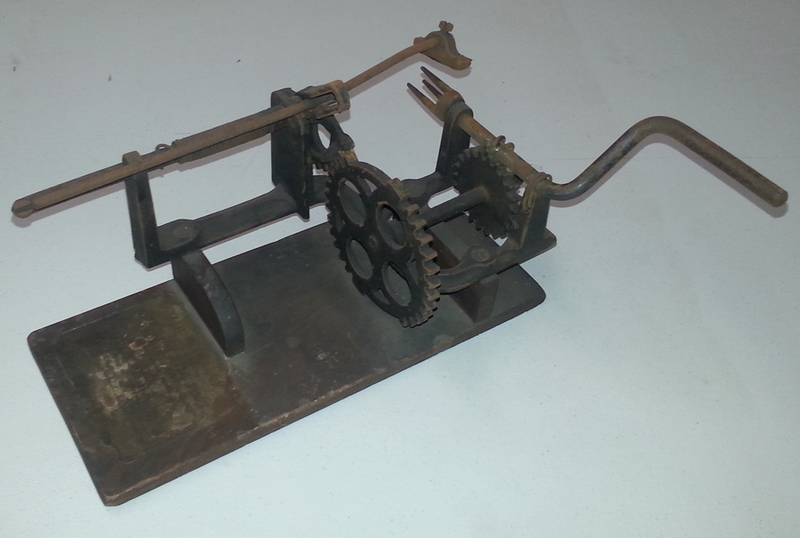 Another fall-themed object caught our attention this week: J. D. Seagrave’s Automatic Apple Parer. One of six apple parers in the collection, this machine was patented in 1854 by Mr. John D. Seagrave of Worcester, Massachusetts. Our staff observed a strong resemblance between the Automatic Apple Parer and apple peelers in our own kitchens. We thank Mr. Seagrave for advancing the technology of apple paring, allowing for easier apple treat-making and eating in New England. Please support the preservation of Historic New England’s one-of-a-kind collection with a gift to the Collections and Conservation Fund.